Back just in time to catch the end of the festival season, Elysian Project's indoor festival experience. Elysian Project has managed to etch itself into the minds of the london underground scene in a relatively short period of time. This is due to the MASSIVE effort that goes into creating the unique festival vibes environment. Expect A massive variation of music and artwork spread across one of the most interesting venues in London. Acidic, ALAN & Wonderland are here again to bring you one of the biggest events in the London calendar! DJs, Bands, Fire Performers, Jugglers, Stilt Walkers, Aerial Shows, Art Gallery, Market Place, Cinema, Face n Body Paint, Games & More. Breaks / Soul / DnB / Swing / Dubstep / Reggea / House / Funk / Techno / Disco / Glitch Hop / Carnival / Breaks / Dub / Trip Hop & any thing else we fancy!! We are once again hosting our very own art gallery and cinema, so make sure to get in contact with us if you have anything you would like showcased. If this is the first you've heard about us, check out this video of a past event. Enjoy! -gorgeous belly dancing troop who will be free styling to our tunes all night long!! No one does it like Elysian! This time its in Newquay, which is know for its great beaches, warm weather and raver friendly atmosphere. Following our very first HTID Weekender in March, where people travelled from all over the UK to Newquay we wondered how we could possibly top it. Then it came to us... Why not combine our largest event of the year, The Summer Gathering, with a site and location that could really make the most of the summer! On 21st September, once again - all roads will lead to Trevelgue as we lay on 3 days & nights of entertainment at this fantastic site. Once again the sound levels will be set to "Booming" and the lasers & video wall set to "Blinding" as we go all out to give you the weekender you deserve! Clean and comfortable holiday homes will be your base for the weekend each featuring a fully fitted kitchen (With the all important microwave! ), Colour TV (Including HTID Weekender TV) and private toilet/shower facilities. Remember - at this site you don't have to pay for gas or electric and all accommodation is within a few minutes walk of the arenas. Trevelgue has a very laid back atmosphere - basically as long as it's safe, legal and nobody complains, you're free to do what you want. This is pretty unique and we're lucky to have found a site that thinks like this and wants you to have a great weekend experience! If you don't fancy staying in a holiday home then we can also offer great value camping pitches, complete with FREE electric hook up to keep your mobile phones, hair straighters or kettles working all weekend! - Amusement Arcade and much more! - Also, look out for our brand new feature of the ZONE BAR. As this is The Summer Gathering it wouldn't be right not to have any outdoor stage. But not any Outdoor Stage... This stage will be on the finest beach in Newquay, Fistral Beach! Coaches will be provided to get you there and back safely for the afternoons entertainment. Tickets for this cost an additional £15, however, book and pay in full for your Bronze, Silver or Gold package before 31st July and you will receive your beach party tickets for FREE!! 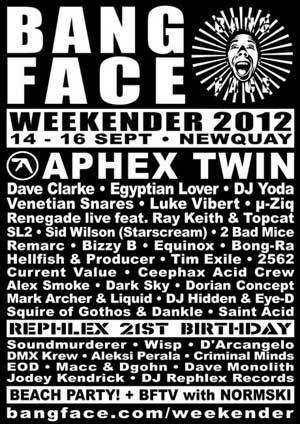 The HTID Sumer Gathering Weekender is easily reached by road via A30 from Exeter. Take the A392 Newquay exit, off the A30, Turn right at the Quintrell Downs roundabout and on the outskirts of the town, at the double mini-roundabout, turn right onto the Porth-Padstow road, B3276. After passing Porth beach turn right again 200 yards up the hill along Trevelgue Road (signed Trevelgue and Tregustick) and you will then see the park in the valley. The one and only Bangface returns for another weekender, their longest stretch of debauchery provided for the good people of planet earth. This weekender is not for the fluffy club goer or the raving virgin. Expect to be pushed to your limits by all aspects of this experience!. APHEX TWIN / DIE ANTWOORD / EGYPTIAN LOVER + loads more! > Plus a special Rephlex 21st birthday party! > All new BANGFACE BEACH PARTY! Custom installed for the Weekender because we know how much you love it! and for the first time ever camping with full campsite facilities! - THURSDAY CHECK-IN FOR CAMPERS! We have just agreed that campers can check-in on Thursday from 3pm! To do this please login to your group account and tick the box within each of your personal details. Locals we hear you! For those who are living / staying nearby you can now get 3-day Weekender Passes. These give you access to all the music areas + beach party. Car parking will also be available each day.